Right, time to turn the spotlight on White Hart Lane. Manchester United are going through a hurried warm-up and a delayed kick-off is a shade over 15 minutes away. Get all the action here. "Younes knows that is going to happen"
Sunderland manager Sam Allardyce, speaking to BBC Sport: "Today's game was a game where it looked like neither team would break the other defence down. I can't accept how we conceded the first goal. We allowed Jamie Vardy to play to his strengths - Younes knows that is going to happen and should have reacted to it. "Our most costly games were not today. A 0-0 draw would have been good for us. The costly ones were the last three, we should have won all three. That wouldn't have seen so much pressure on ourselves and that is what told today. "We have to win the Norwich game. If they win they go so far away from us, and they are the last team we can catch now. We have to try and win it. If it's a draw it's a draw and there are still five games left but worst of all is letting Norwich win." They are away bang on time at Anfield. You can get all the latest with Mike Whalley's live text commentary over here. Leicester manager Claudio Ranieri speaking to BBC Sport: "We knew it would be tough, it is normal because Sunderland are fighting to be safe, but I am very happy for the three points. Our performance was very solid, of course they had the chance to draw but we had three or four chances to finish it early. "It is important for Jamie Vardy to score because he made some good assists in the last game but he is our goalscorer and he needed to score again and I am very happy with him. "The fans must continue to dream but we must continue to be concentrated and focussed. Now we have two tough matches at home, the Champions League is on the table and we have to keep it. We don't achieve nothing yet. "We have to stay calm, be focussed, strong, solid and keep going. You make this job for the emotion you feel inside but it is difficult for me to tell what kind of emotion. Today we made some mistakes, we still have to look at what is not right." If Tottenham lose today against Manchester United, Leicester would need only two more wins from their final five games of the season. In that situation they could win the league in a fortnight's time at home to Swansea. Their remaining games are: West Ham (h), Swansea (a), Man Utd (a), Everton (h), Chelsea (a). A defeat for Tottenham today would also mathematically guarantee Champions League for the Foxes. Tottenham make two changes from the team which drew at Anfield as Erik Lamela and Jan Vertonghen return to the side. Vertonghen has been out since the end of January. Manchester United make just the one change and it's at right-back, where Timothy Fosu-Mensah replaces Matteo Darmian. Man Utd: De Gea, Fosu-Mensah, Smalling, Blind, Rojo, Schneiderlin, Carrick, Mata, Lingard, Martial, Rashford. The big news from White Hart Lane is that kick-off has been delayed by half-an-hour until 16:30 BST because the Manchester United coach is stuck in traffic. These tight turnarounds from midweek European action are hard to organise. Louis van Gaal's merry band are now on site. Tom Rostance's live text is up and running. Let's have a look at the team news. "We were very poor after the opener"
Sunderland manager Sam Allardyce, speaking to Sky Sports: "We were nervous today because of how big the game is. It's a legacy of not picking up the points when we should have done. That caused us to do the wrong things to try and get back in the game. "We didn't pass it anywhere near as well as we can. I think that was the main problem, not Leicester. "We kept losing the ball in good areas, it was nothing like the passing game we showed against West Brom. We switched off once and our defence allows Jamie Vardy to do what is his major strength. "He does what every top goalscoer does and scores it. The disappointing thing was how we reacted to that. "Norwich was always going to be big. There would be less pressure if we had won but today was always going to be difficult to win. We are under extreme pressure that we have to make sure we handle." Leicester midfielder Danny Drinkwater, speaking to Sky Sports: "We've got a few games left. It's a step but a very big one. It this puts more pressure on them then perfect but I can't see Tottenham putting too much on this. It's up to them know. The fans here are brilliant, and credit to the lads we deserved that." 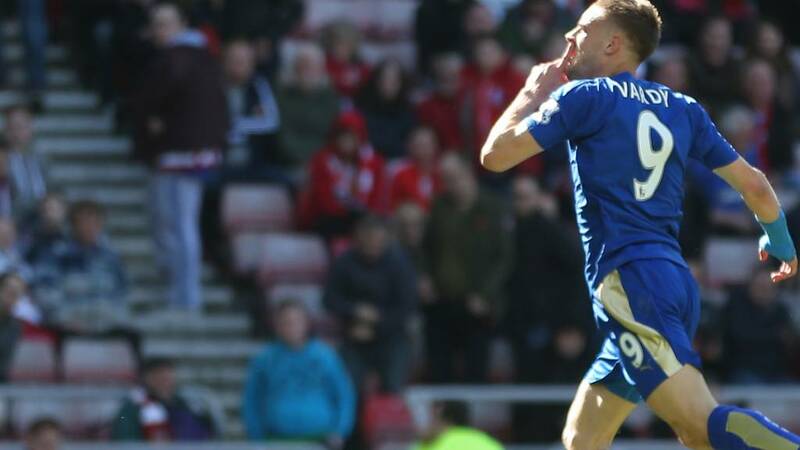 Leicester striker Jamie Vardy speaking to Sky Sports: "Coming off the Sunderland fans were clapping us as well which is brilliant. It was a great game, we knew it would be tough but managed to grind it out. It's a step closer to possibly winning the league. We'll enjoy this for the rest of the day and then get back to training for the next week." Danny Drinkwater has just appeared in front of the television cameras. The Leicester midfielder is struggling to keep his poker face as he parrots that there are still plenty of games left in the title race. Leicester need three wins from their next five games to be sure of the title regardless of what anyone else does. "Leicester were so well organised and they always seem to get at least one opportunity don't they? They've been fantastic, kept the ball well and everybody looked comfortable. They've not won the league yet,but they are close." Ash Williams: Vardy has been quiet all game. Very few chances but clinical. Jamie Vardy gets a hug off a young fan who has escaped the stewards' attention. Claudio Ranieri looks like the gravity of the situation has started to dawn on him. There is a tremble on the Italian's lips as he heads down the tunnel. Sunderland's fans sportingly applaud Leicester's players. The Black Cats now have a hum-dinger of a game away to Norwich next. "Credit to Leicester for the way they played and to Jamie Vardy - two opportunities got two goals. But Sunderland were all over the place once they conceded. That's when you're looking for characters and too many threw the towel in." One Leicester fan holds up a mock-up of a London Underground poster asking north London to "mind the gap". We keep waiting for the nerves, the stumble, the lack of title-winning experience to show itself. We are waiting in vain. Leicester are 10 points clear at the top of the Premier League. "That goal just sums it up. Sunderland have been weak. You cannot allow yourself to be out-muscled there as the last man. And Mannone was in no-man's land." Jamie Vardy races past Patrick van Aanholt, nicks the ball past the advancing Vito Mannone and taps in the one that makes absolutely sure.